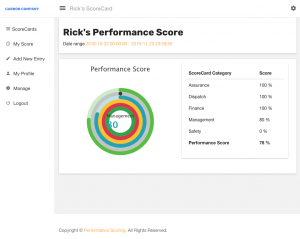 The MyPerformanceScore page displays your PerformanceScores for each ScoreCard Category that you are scored in relative to your peers that are also scored in these categories. It also displays your overall performancescore. To view the MyPerformanceScore page first login to your company’s Performance Scoring application. Once logged in the homepage will be MyPerformanceScore. Here you will see your overall performance score and your performancecore for each ScoreCard Category that you are scored in dating back 30 days. You can also view your scores on the responsive circle graph on the left side of the page. As you scroll over the circle graph each color represents a different ScoreCard Category and your performance score will appear in the center of the graph. Your PerformanceScore can be filtered by date range by selecting the dates in the date range at the top of the page. This allows you to view and compare your month–over–month or quarter-over-quarter development in each of the ScoreCard Categories that you are scored in. To view the entries that lead to the performance scores, use the FactorBoard. For additional support please contact your Account Manager or email support@performancescoring.com.